All right, so I'm re-arranging my home office this morning. This old parlor (built in 1912) is filled with toys, models, and memorabilia, and my desk is a vast mess of sci-fi and horror clutter. I'm currently working on a book, fine tuning some articles, completing a short story, and editing The House Between. Surrounding me at the moment is Electroman (Ideal; 1977), whom I will get around to blogging about at some point, my cats Lila and Ezri, and a calendar, plus stacks of DVD screeners I haven't gotten to yet (Viva Laughlin, anybody?) and more. So today, while I re-arrange and make some "sanity" space for myself, I'm going to gaze at some of the weirder Star Trek items in my office before I either re-display them or box 'em up and take them out of rotation. And you, lucky reader, get to learn all about them!!! First, we've got Star Trek: First Contact "flavored lip balm" with a cap that is shaped in the form of the Enterprise E. "Protect and moisturize your lips with our Star Trek lip balm," reads the back of the box. For particularly dangerous away team missions, no doubt. "Its special formulation helps to smooth and protect lips from sun, wind and cold weather. Everyone will enjoy playing and collecting toppers from Star Trek: First Contact." I wonder...is this what the Borg Queen wears? Dr. Crusher? Next, I'm looking at a Star Trek thirtieth anniversary "commemorative anniversary pen." The box here reads: "In conjunction with Paramount Pictures, to commemorate 30 years of Star Trek, Fisher Space Pen presents the 30th Anniversary Space Pen. This pen's unique cartridge allows you to write in zero-gravity." Ironically, this is how I sign all my Lulu Show LLC checks (in zero gravity), but hopefully not with zero-balance. Next are - yuck - some collectibles I should have gotten rid of a long time ago, because they are getting increasingly disgusting by the day. I have procrastinated too long, and now Kathryn is giving me strange looks. 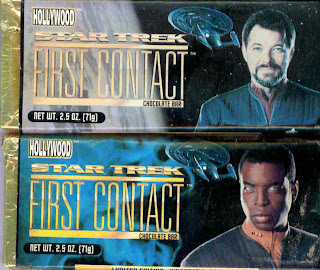 These are Hollywood Star Trek First Contact chocolate bars. They are a "limited edition," with six different wrappers featuring images of the Next Generation crew. These are also from 1996, which means the candy bars are eleven years old now. I took one off the shelf today and it turned to toxic dust in my fingers. Now I'm breathing it in. I collected all six of these candy bars at the time of the film's release, and just couldn't get rid of them. As per Kathryn, they are going in the trash today. Some collectibles...well...you just have to let go. 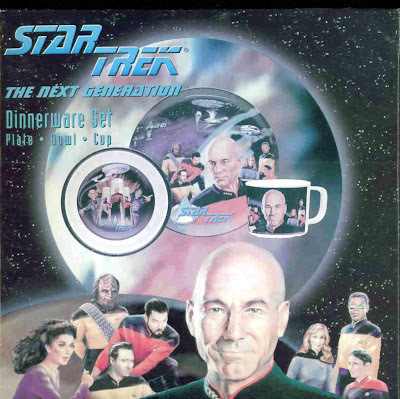 Next up: It's a Star Trek: The Next Generation Dinnerware Set (From Zak Design). It has a cup, bowl and plate. 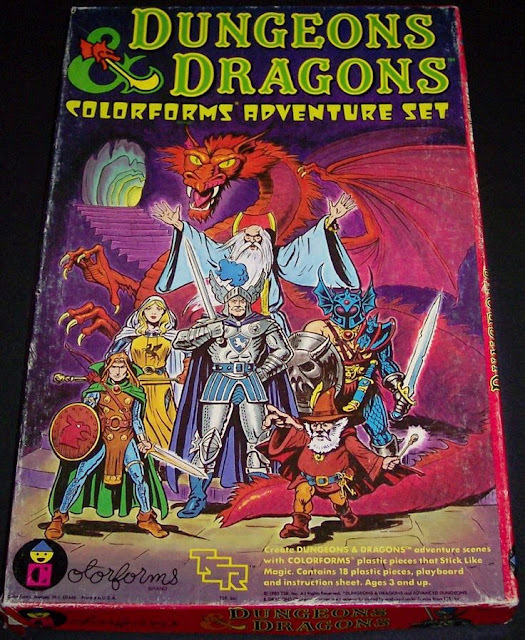 I still have this one mint in box. One day, I'm going to open it and refuse to eat off of anything else. The next day, Kathryn will disown me. 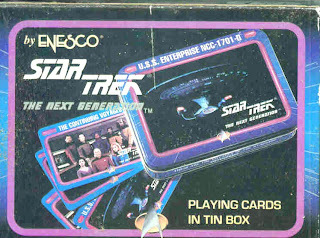 Then, from 1992, I've got Enesco's Star Trek: The Next Generation Playing Cards in Tin Box. If you can't watch Star Trek, the next best thing is playing with a deck of cards, apparently, emblazoned with United Federations of Planets imagery. Yes, my collection runs deep - and strange.